TICKETS: Purchase at the event to sample foods. Each sample ranges from $3 - $7. 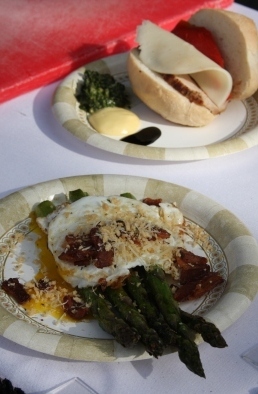 Find your favorite restaurants at the 11th Annual Sandpoint Summer Sampler... be there! The Sampler is held in downtown Sandpoint at Farmin Park, on Main Street adjacent to Jeff Jones Town Square. Come "taste" the flavors of our area at a street party you won't want to miss! The area’s favorite restaurants, breweries, and wineries serve samples of their most delectable culinary dishes, wines, and brews. And while tasting samples, enjoy the Litehouse sponsored cooking competition where local chefs battle for the "best of" with spices and ingenuity. Check back soon for more information on this year's Summer Sampler. Come and stay for the weekend for other events happening around town, the ever-popular Farmer’s Market, and the summer season at Schweitzer Mountain with scenic chair lift rides, village activities and more. FOR MORE INFO: Contact the Greater Sandpoint Chamber of Commerce at (800) 800-2106 / (208)263-2161 or e-mail info@sandpointchamber.com.